Planning on travelling in the wild? 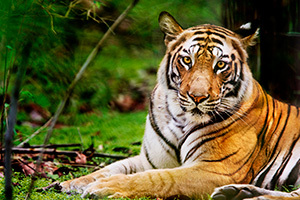 Get up close with tigers this time, at Bandhavgarh National Park. Bandhavgarh National Park is one of the most popular national parks and the best-known tiger reserve located in central India. It boasts to have the highest density of tiger population in the country. Day 01: Drive from Jabalpur to Bandhavgarh by car (200 kms / 4 hours journey). Check-in at Resort. Optional safari in Bandhavgarh. Day 02: Morning and evening Safari in Bandhavgarh. Day 03: Morning and evening Safari in Bandhvgarh. Day 1 and Day 4 safari depends on your arrival and departure time. Safari zones will be decided at the time of booking. In case of current safari bookings, zones will be decided at the last moment. We put our best efforts to give you best zones as per sighting requirements.